I love hearing the tea kettle whistle, the ritual of pouring bright boiling water over some herbs in my tea pot, and reflecting on the change of seasons while making mental notes of to do’s. As I’m “sageing”, I’ve become acutely aware that these patterns of seasonal change and the incremental steps towards winter, though necessary, often feel hurried and frantic. Making tea helps me through the adjustment. Selecting the herbs and spices that will nourish and benefit the body today, also brings balance and strengthening for the coming winter months. Echinacea, ginger, nettles, and marshmallow are just a few lovelies making their way into my cup. The last few days I have been collecting seed and picking a few lingering veggies from the garden as well as preparing to make Fire Cider, an awesome medicinal tonic for the long winter months ahead. The following recipe is a favorite created by Rosemary Gladstar. I had the pleasure of hearing Rosemary speak at a seminar a couple of years ago as part of the Free Herbalism Project in Eugene Oregon. She’s pretty awesome and has been an herbalist for over 30 years. 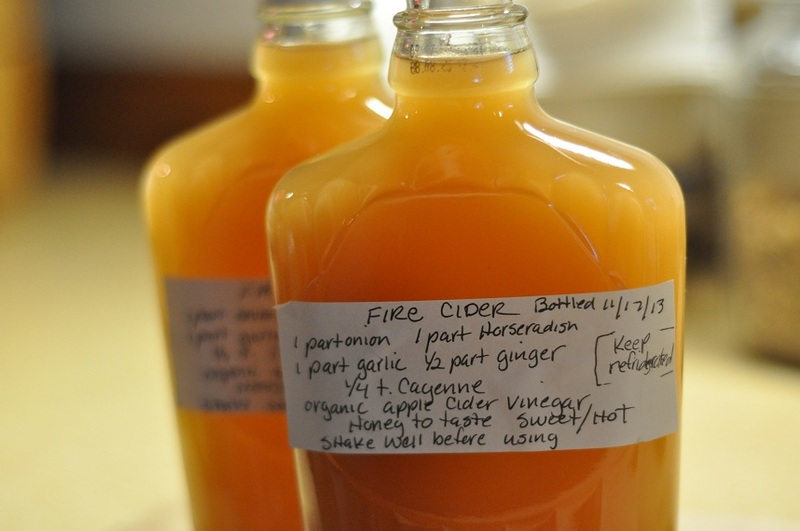 You’ll love this Fire Cider and be glad that you have it in your cupboard this winter. Chop the vegetables and layer the proportions into a 1/2 gallon mason jar. Fill the jar with Apple Cider Vinegar, completely covering the vegetables. Put on a lid with a good seal and keep your jar nearby on the kitchen counter where you will see it daily so that you can gently shake and turn the jar to allow the cider to fully draw out the nutrients from the vegetables. Do this everyday for 6-8 weeks. At the end, strain off the lovely cider in a cheesecloth and squeeze out as much juice as you can, then compost the pulp or reserve and refrigerate for a condiment that can be chopped finer and used in stir fries, spring rolls, etc., for a nice aromatic and spicy addition to your meal. To your reserved cider, add the Cayenne to the level of warmth desired then add honey to sweeten. After you’ve achieved your desired level of hot to sweet, go ahead and decant into bottles or jars. I like recycling maple syrup bottles for this purpose. Label your jars with the contents including dates prepared and decanted. Store your cider in the refrigerator and be sure to shake before using because there will be a lovely nutrient dense sediment naturally occurring that you’ll want mixed into the cider before dosing. 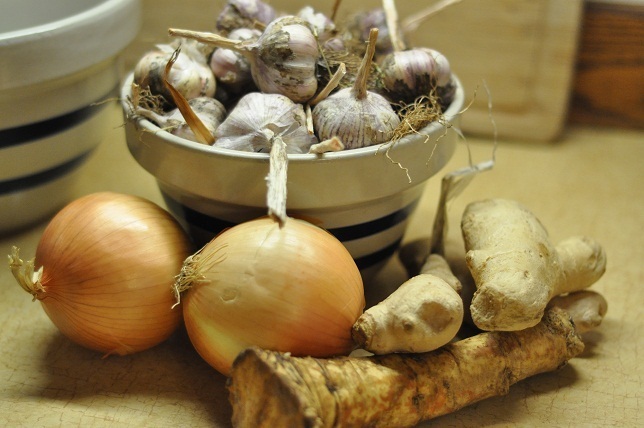 As an anti-viral remedy, take 1-2 tablespoons at the onset of a cold or a scratchy throat. 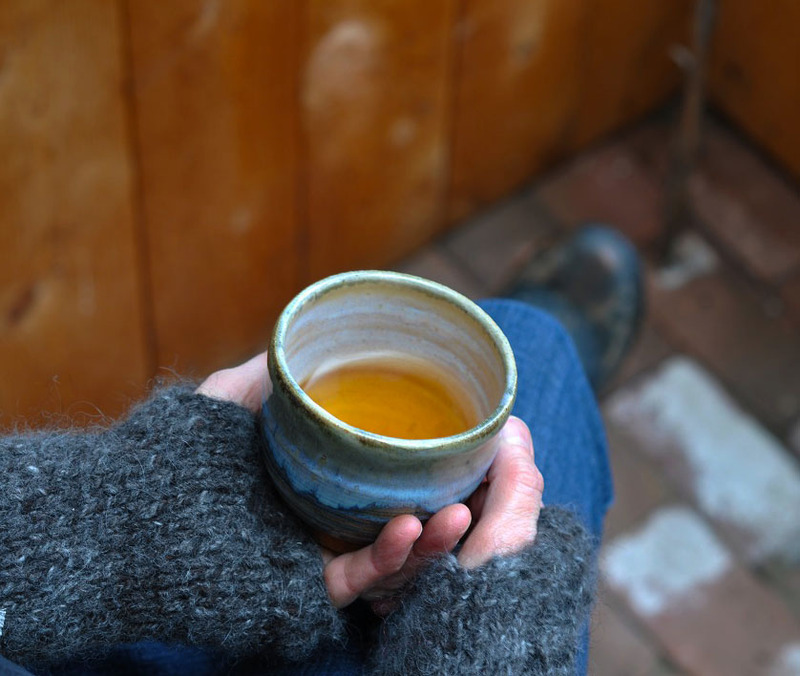 But consuming a bit of Fire Cider daily as a means to warm up and increase your circulation for the cold day ahead is perfect. The apple cider vinegar helps alkaline your system too. And, an added bonus is that as your Fire Cider matures over the months to come, it takes on complex flavor notes that make for a beautiful home-made vinaigrette for salad and greens. This cider is such a wonderful tonic for the whole family in many ways. Happy Fall! This entry was posted in Kitchen Stuff and tagged fall, fire cider, good stuff, recipe, Rosemary Gladstar, seasonal. Tom Kha Soup. You need it!